This week of cool temperatures has brought more rain to southern Minnesota. In fact, on late Wednesday afternoon 9/15, over 1.5 inches of rain fell in St. Peter in just a few hours. This downpour would have been impressive enough by itself, but the highlight for most of us came during several minutes of hail with the diameters of quarters and even golf balls! Hail is often associated with tornadic activity, and sure enough cloud rotation was observed in North Mankato that same evening, although no funnel clouds formed. It’s been a while since we’ve seen hail of any substantial size in St. Peter, but with the town’s stormy history this isn’t necessarily a bad thing. This weekend and next week look to be a little drier according to the next ten days’ forecast, but temperatures should remain comfortably in the 60’s and low 70’s. 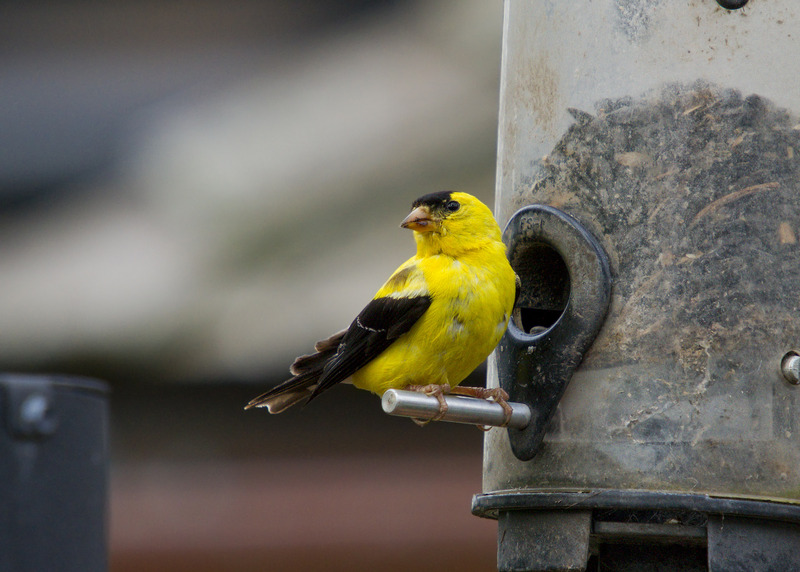 Fall is the time for visible transitions in nature, and one of the most noticeable changes for those who feed birds is the molting of the male American Goldfinch. The vibrant yellow-and-black breeding plumage that he acquired in April is now fading into a dull olive-gray, which means that in another month or so he’ll look almost identical to the female. Right now these birds are increasing in number at most feeders in southern Minnesota, as some northern birds are migrating south and mingling with our resident goldfinches to fatten up for the coming cold months. Their numbers should begin to diminish in November, but in many southern Minnesota locations these birds remain year-round (especially if feeders are kept full). Molting male American Goldfinch feeding on black oil sunflower seeds at feeders behind Interpretive Center, 9/17/10.